Our final celebration of elit! Thank you Karina for a thoughtful presentation of Like Stars in A Clear Night Sky. 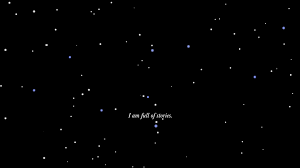 “Like Stars in A Clear Night Sky” is a flash-hypertext poem. Elegant and ethereal, the screen is a dark night sky with a constellation of stars that become the access point for further poetic lexia. Readers can explore the sky of interconnected poems at random. There is an introductory voice-over poem in Arabic (with translation on screen in English). The text is laced with ambient sounds of wind-chimes, offering the effect of a recollection of a distant place, a place of purity/simplicity, perhaps the “village” of one’s origin. The tone of the text is soothing, calming, and dreamlike. The reader wanders through the cosmos with the mouse, hovering on certain stars to reveal a variety of poetic verse which represent the texture of certain lives. “Like Stars in A Clear Night Sky” reminds us that our subjectivity is only apprehendable through narration, through words, through stories past on through time. In a subtle and wistful way, this text traverses an essential tension that is a part of the human experience. It prompts us to think about the ways in which we are inherently connected in both time and space, as well as the sting of our profound singularity. And thanks to Jordan for your great choice of Quing’s Quest as well. This piece is definitely a fun selection and another great way to end our tour of the wondrous world of elit. 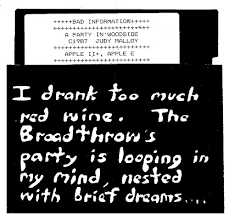 This twine game is marked by a quirky nostalgic soundtrack and stands as a parody that playfully addresses the subculture(s) of gaming. 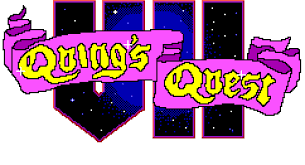 Quing’s Quest VII is a reversal-of-power-fantasy in which creative non-conformists and non-“misogynerds” thrive by escaping and relaxing a bit. During Jordan’s walkthrough, we might reflect on the identity politics found in games, and in the community of players that form around them. There is no blog post for this last week. Rather, you will work to complete your creative piece of electronic literature. The plan for our final class is to celebrate together with a potluck feast and an informal share out of your final project! And I will also go over how to add your elit creative work into our very own ELC (Electronic Literature Collection). Your elit walkthroughs: I am not requiring you all to present your final elit piece, but I am hoping the majority of you will feel compelled to share your work with all of us. Please let us know what you made, why you made it, what you like about it, and what you wish you might have done better. You will be surprised at how much talent and inspiration exists in our ranks! I am sure we will all really enjoy hearing about everyone’s ideas and creative inspiration, etc. 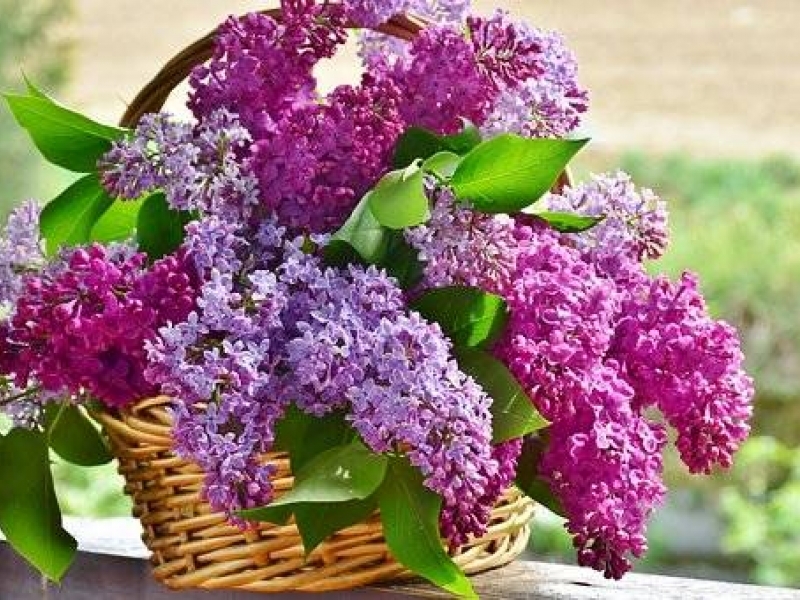 This is a friendly and supportive community, so don’t feel stressed about sharing. 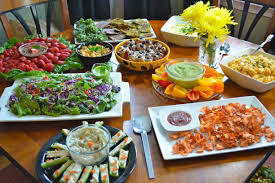 The potluck food: Everyone should bring along some food or drink for the class. Please sign up here for what you will bring along so we can plan a diverse menu. **Your submission of your final self-assessment portfolio & narrative is due by email by Monday, Dec. 17th. Thanks to all of you for a wonderful semester. I have had a great time sharing the world of Electronic Literature with all of you, and I have been impressed by your interest, your blog writing, and our thoughtful discussions together. I hope you will all keep in touch. Also, if any of my undergraduate students are interested in a graduate degree in English, please let me know. I would love to tell you more about our special MA program in Writing Studies. And I would love to continue working with you. Happy Holidays everyone! I look forward to reading each of your elit portfolios. 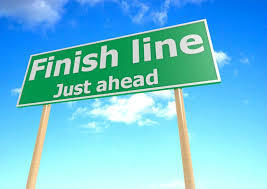 The finish line is in sight…. Well, the wifi was a real problem in CAS last night, reminding us of the contingencies of network-dependent work and disrupting our flow. Still, we were able to pull off two presentations despite the intermittent signal and the ELC being temporarily “down”. One presentation focused on an early elit classic, while the other was based a digital poem that made us think further about our body’s relationship to the machine. Thank you Darline for an excellent and thorough presentation of Judy Malloy’s classic Uncle Roger. Written in 1986 in the very early moments of networked community formation, the story is set in Silicon Valley, California. 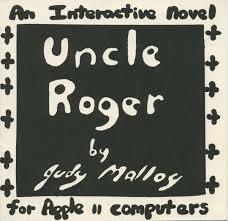 Intertwining poetic lexia with Silicon Valley culture and semiconductor industry lore, Uncle Roger is an early work of hypertext narrative. It debuted as -an online serialized story on the Art Com Electronic Network (ACEN) conferencing system called The WELL; -as an interactive UNIX Shell Script-authored “narrabase” published online on ACEN; and, using the historic programming language BASIC, as -a disk-based hypertext that was packaged as artist’s software. The work is part of some of the first discussions of the potential for “software as art” and draws on Judy Malloy’s experience in database programming. 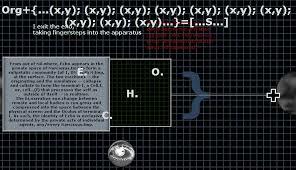 It makes use of a node-based model of molecular narrative units that, when combined, allow for non-sequential storytelling. Written and programmed by a woman and featuring a female narrator, this early example of electronic literature is groundbreaking for numerous reasons. In pursuing a close reading of Uncle Roger and sharing with us footage of Judy speaking about the origins of the piece, Darline highlighted the Pathfinder’s Project. What happens to literary works meant to be experienced on a computing device when the software and computer systems with and for which they are created update, change or become obsolete? Do we allow these works also to become obsolete, or do we find ways to preserve them since they are important literary and cultural artifacts? Pathfinders: Documenting the Experience of Early Digital Literature, led by Dene Grigar (Washington State University Vancouver) and Stuart Moulthrop (University of Wisconsin––Milwaukee), is a digital preservation project that captures an important moment in literary history: the development of early digital literature. Thanks Angelique for choosing and presenting on the digital poem called Separation by Annie Abrahams. With Abrahams linear yet interactive poem Separation, we are prompted to think about our relationship to machines (computers). What is the relationship between the human body and the computer? Are we joined to our computers as much as we think? With each click, we receive one more word of a poem written expressly to/for the computer. The pace forces you slow down, and the exercise supports a kind of “restoration” of your body. We agreed that the interactivity presented here takes on a new tenor – it is simple, linear, and yet it forces not just your mind but your body to engage in the interaction, drawing attention to how much our physical embodiment is strained under the sway of one’s personal computer. An important reminder as we continue to think about all the ways technology continues to shape and contour the very way we live our lives. Most of you (at this point) are in “full production mode”. What I mean is that beyond building out a story concept (through outlining, storyboarding, and collecting/curating digital materials), you are now putting the story together (and using certain digital tools to do this). Remember that there are a wealth of tools out there to tinker with, and you can use different tools for different parts of your final composition. Many of you have decided to work in Twine which is fantastic. There are many other digital tools to create interactive fiction that you might check out as well. In class I mentioned -Quest, -Storybird, -Squiffy, Inform, StoryStylus, BookCreator, StoryMaker. You can also work with more familiar or widespread tools like Prezi, Wix, and WordPress (you can use these tools in new and creative ways to tell a compelling interactive story). Please realize that if you are not composing your work yet, then I urge you to jump in this week, as we are nearing the close of our time together. Warning: this kind of creative composition work takes a certain amount of time, and you cannot leave it to the last minute. This is why I have devoted a certain amount of time to it since October. On the evening of Tuesday, Dec. 11th we will have our last class together. That evening we will have some food (we will plan a potluck with a sign up) and that night you are all invited to share a walkthrough of your elit work. You are also welcome to bring along friends and family to class. The absolute FINAL deadline for formal submission of your elit work will be on Monday, December 17th. That submission will be an electronic submission (rather than an in-person hand in). More details on the plan and place for submission to come next week in class. Next class is our final day for some elit reviews and some workshop time! Please read Quing’s Quest. Jordan will present/walk us through this elit Twine game. 2. Please read Like Stars in A Clear Night Sky. 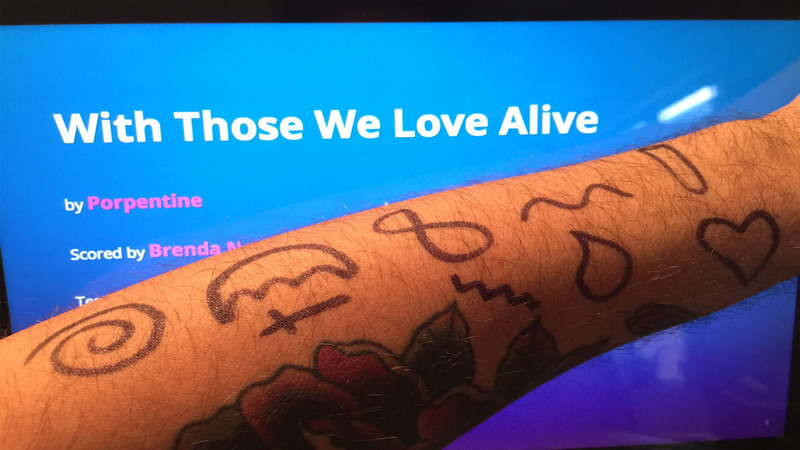 Karina will share her reflection on this digital poem. By now you are supposed to have already completed ten blog posts. In short, you have reviewed ten different elit works (over the course of weekly reflections throughout the semester). Many of you are all caught up and have done a great job at this consistent work. Your final portfolio is almost complete. (There is only one more “final self-assessment narrative”. But it is not due until December 17th. I will speak about that next week in class.). If you are all caught up and have already written your ten blog posts, then you can take the week off from blogging this week and just work on your elit piece. 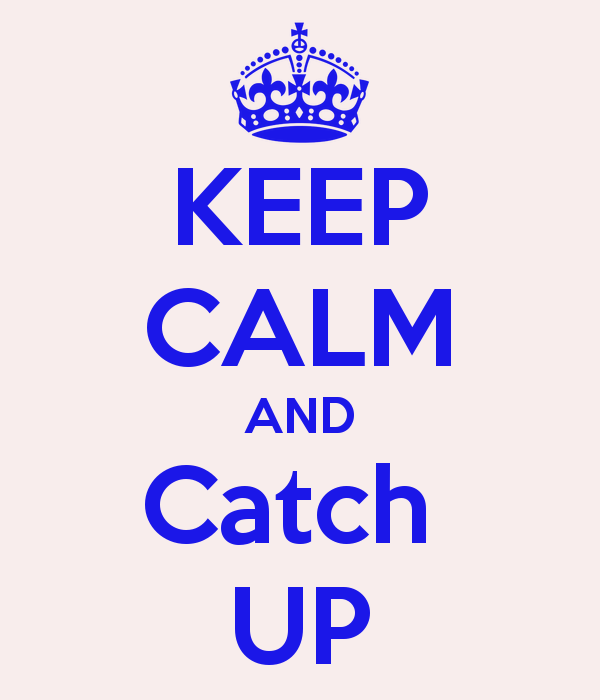 But if you have missed a week of posting (…or several weeks), then this final week is designated a “catch up” blog week. That means, if you are under the ten-post-blog-total currently, you should blog on one of the two above pieces. I look forward to reading your thoughts about one of these texts. Hang in there at this busy time in the semester! I know it can be stressful. 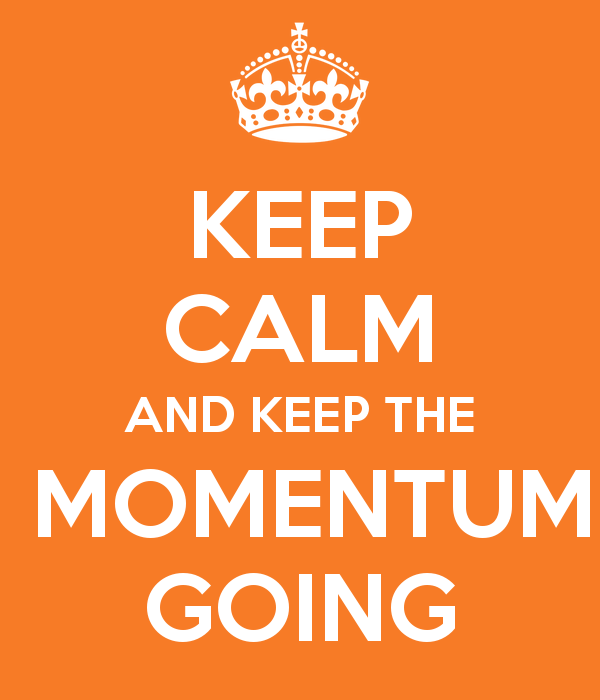 Just remember – step by step – and you will eventually get there. This week we were able to look closely at classic forms of two distinct elit genres – kinetic poetry and IF (interactive fiction). I am glad that we have taken a moment together to consider these forms of digital narrative. Thanks to Michaelle for selecting and presenting on the piece Cruising by Ingrid Ankerson and Megan Sapnar. 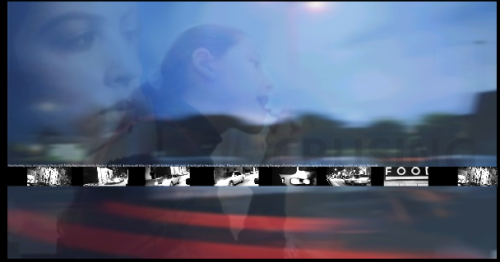 A Flash piece that is both linear and cinematic, this poem interactivity is specific and compelling in that it complements the subject of the poem, the coming-of-age ritual cruising. The design of the interface is simple yet unexplained, and it ensures that the form/structure of the text mirrors the meaning of the text. Michaelle had us think about the innuendo in the title itself. The poem mirrors the precarious and fleeting feeling of driving without a destination in order to feel the freedom of open possibilities. Michaelle also prompted us to think of the theme of “challenge” embedded in the poem. A new reader must first struggle with gaining control of speed, direction, and scale in order to follow the textual path of the narrative. Perhaps the poem is ultimately about the delicate touch required in order to read the world. Reading this poem and tinkering with the interface in order to focus and find a certain balance for apprehension is a bit like navigating life itself. We then moved on to Book and Volume which was created by Nick Montfort in 2005. An interactive fiction written in Inform and running on the Z-Machine, Book and Volume simulates an eventful day in a near-present factory town of 24 blocks called nTopia. nTopia is a planned (gridded) city inviting relatively open exploration from players while also functioning as a textual motif. Here, you wake up in your bed. 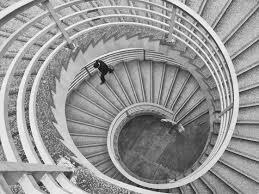 You must discern the world you find yourself in and figure out your mission to proceed. You are an information technologist, and your task (delivered by pager) is to reboot the servers. The “game fiction” is entirely text-based. Your read text and input text. 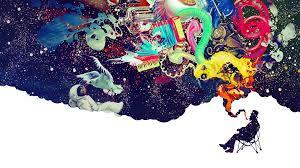 As a reading/writing experience, it is a palpable world that comes to life right inside your head. In this sense, it represents IF in its purest form. Thanks to Sara for an excellent walkthrough demonstration. In order to uncover the true core of the piece, you need to explore the city with a fine-toothed comb and closely examine objects that, upon their first mention, seem unremarkable. It is a truly rich and complex world that Monfort has built, with a variety of quirky objects and circumstances. It has a seemingly endless variety of corners and nooks to discover and explore. Along the gameplay-way, you build out a map. As you discover your surroundings, your sense of this fictional world in space is filled in little by little, allowing you to apprehend this world that you have dreamt your way into. When continuing to compose your own elit, I am prompting you to consider the experience of the interface for the reader. How does the reader navigate through your creation, and does that specific experience generate certain meaning? Is there a purposeful design (or logic) to the nature of the interactivity you have created? You now have about 3 more weeks left before you will submit your final project and close out the semester. Yes, …time is flying… so it is very important to build out a schedule for yourself so that you can meet the deadline of Dec. 11th. If you haven’t decided on the digital tools you will use to compose your piece, that should be a priority at this point! And if you haven’t started the actual creation phase (making your story or text) then you need to jump in at this point. It will take time to tinker and refine your efforts, so now is the time to get a prototype down so you can use the remaining time for editing and refining your composition. 1. Please read Uncle Roger. Darline will walk us through this classic elit work. 2. Please read Separation. Angelique will present a walkthrough of this digital poem. 3. Please write your tenth #elitclass blog post: you can choose one of the above two selections for response/reflection. And I encourage you all to tweet your blog post using the #elitclass hashtag. 4. Please add a closing paragraph in your blog post this week which provides a clear update on your progress regarding your elit creation. Have you selected your digital tools for composition? Are you in the production phase yet? How is that going? Are there certain concerns that have come up? I look forward to seeing you all next Tuesday! 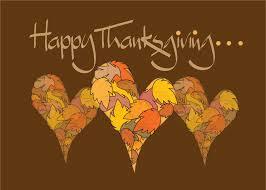 And of course, Happy Thanksgiving to all of you. Rest and relax, eat well, and have some fun. On the road to elit creation…. It seems that the two works we took a closer look at this week prompted us to think further about the issue of preservation in the context of electronic literature and digital art. Although obsolescence is a problem for every form of cultural production (even the pyramids will wear away), the reliance of computer-based creations upon a particular and delicate matrix of software and hardware makes preserving and archiving digital work especially challenging. 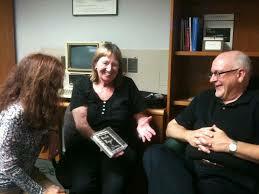 There are organizations and programs dedicated to this aspect of the field of Electronic Literature. Nevertheless, while these pioneering elit works promise to form a major part of the future of our literary heritage, they are fading rapidly into technological obsolescence. There is work to be done. Preservation is fast shaping up to be a significant specialization in the overall field of digital art. Thanks, Serken for re-engaging our analytical eye with our next #elit walkthrough review from the ELC Vol. 3 – Icarus Needs – by Daniel Merlin Goodbrey. 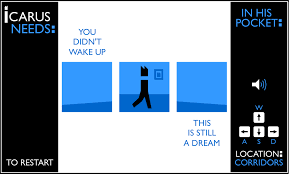 This digital comic adventure-quest had us all thinking about the fine line between waking life and the dream world. (….Because as your mother might have warned you, you never know when you might fall asleep playing a video game.) And isn’t it true? Life is like a dream…or some kind of adventure-quest game? I guess you could say that Icarus Needs is video game mechanic-come-quirky philosophical inquiry. We collect magical objects, hit many dead ends, jump over chasms, solve mini-puzzles, and wake up by falling, falling, falling. With metaphorical/symbolic language laced throughout and a digital interface that renders a kinetic-comic-strip experience, Icarus Needs is a text that certainly challenges our traditional sense of the “literary” as it makes us think further about what literature can be. I especially appreciate Serken’s focus on this question throughout his presentation. The beginnings of an answer may be found in several of the astute close reading observations made about this unique text during his class walkthrough. You now have been split up into smaller working groups in order to work together at planning/designing/building your own elit creation. You are all at various stages of invention and discovery when it comes to conceiving of a plan for this creative project. Remember to spend some time exploring the affordances and constraints of varying digital tools to compose with. I want to remind you all that I have suggested a more extensive turn at storyboarding as a way to push your developmental progress with this assignment. Please take a closer look at the tips shared here, and try to work through a clear outline/map/storyboard concept to share with your groupmates for next week’s workshop. In addition, it is now time to start collecting material (create organized files) that you might use in building out your project (collect images, sound files, videos, lexia, etc). Any creative effort needs time to germinate and grow as you work through your thoughts and ideas. As a clear and fair warning, you will need to devote some significant time to this process between now and the close our semester. I have set aside some workshop time in each of our remaining class meetings, but these meetings are a “check-in” – they are there in order to help with your timeline and project management overall. You will all benefit from the peer support and learning that comes with the class workshop time. But understand that in the end, the progress and timeline for the completion of this work will be managed by you, and it will take a certain amount of time to make your elit (outside of the class workshop moments). 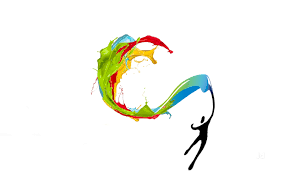 Said another way – it is wise not to leave all the creative composition work to the end. 1. Please read Cruising. Michaelle will do our walkthrough and present and lead our discussion. 2. Please read Book & Volume. Sara will present a walkthrough of this one. 3. 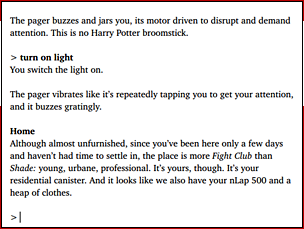 Please write your ninth #elitclass blog post: you can write on one of the above two selections or both texts. As always, I encourage you all to tweet your blog post using the #elitclass hashtag. 4. Please add a closing paragraph in your blog post this week which provides a clear update on your progress regarding your elit creation. Please summarize the planned work thus far, and what steps you have taken to manage the project. Have you chosen some digital tools to work with? Have you started collecting digital materials to include in the work? Have you made a more developed version of a storyboard or map to share (please include this in your blog). I am enjoying each and every discussion of electronic literature we engage in! Your selections so far have been diverse in terms of genre and form, but also in terms of theme and symbolic import. Thank you Priscilla for bringing us into the world of Façade! Priscilla’s blog post on the work is here, where she provides some interesting material from the authors about their composition process for interactive drama. 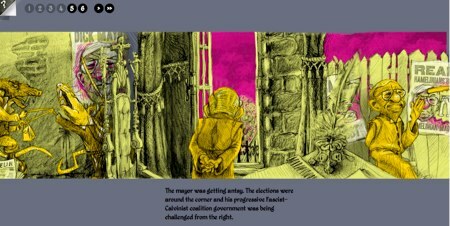 Façade is an artificial-intelligence-based interactive animated story that won the Grand Jury Prize at the 2006 Slamdance Independent Games Festival. The piece has been exhibited at several international art shows. “The reader” assumes the role/perspective of a close friend of Trip and Grace – a couple who recently invited the player to their home for cocktails. 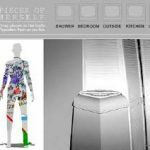 You enter their apartment where you can move, explore, and discover the space, and you can interact with some objects. From the onset of the experience there seems to be significant marital difficulty between Trip & Grace. The tension is palpable and the bickering is unrelenting. The reader/player is able to interact by “speaking” to the troubled couple, and soon there is a complex triangulation of dynamics between the reader/player and Tip & Grace. The player can attempt a reconciliation, or push them to further discord. This is an open-ended design with many possible outcomes. In some versions of play, one might be “kicked out”. In other playthroughs, certain affairs can be revealed. The piece prompts a reflection on the difficulty of understanding between people (even those who are supposedly close in an intimate sense), and of the perils of human listening/not listening. To wax philosophical, each human being is a complex universe. So perhaps a human relationship is the collision crash of two separate universes? This piece certainly draws out the collision quality of profound resent between two people, drawing the viewer into certain third party anxiety. Our discussion of Pieces of Herself by Juliet Davis was truly insightful, and it was a joy to read some many smart thoughtful blog posts about this reading. Thank you to Nikki for your excellent walkthrough – I enjoyed the consideration of hear room or space we entered by engaging with this piece. This interactive digital art text makes use of much less lexia than we have seen in the previous e-lit pieces we have explored together. Instead, this work makes great use of a drag and drop interface – viewers can scroll through familiar environments (i.e. 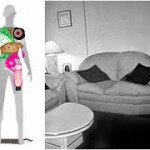 bathroom, living room, outside, the office) to collect metaphorical “pieces” of the self and arrange them in compositions inside the body by dropping them down in a dress-up doll. The reader/navigator can customize their exploration of the work by filling in the dress-up “paper” doll (or woman’s silhouette). As each “trace” is dragged into the paper doll silhouette, it triggers animations along with audio clips from interviews with women, music loops, and sound effects, resulting in a layered narrative effect. 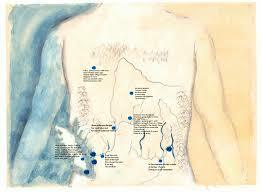 We discussed the traces and marks (read “scars) left behind as a woman lives her life. The marks left by private and public aspiration, desire, hopes and dreams, and violation too. There is much challenge and pressure in becoming a woman. The colorful accumulations on the silhouette emphasize the theme that some many competing ideologies leave lasting marks, imprinting a woman permanently. Davis’ work emphasizes the irrevocable layering of all the experiences that shape and mark a young woman, highlighting the social inscription of the feminized body. 1. Please read With Those We Love Alive. Rene will present a walkthrough and lead our discussion on this twine game creation. 2. Please read High Muck A Muck. Emily will present a walkthrough of this beautiful hypertext composition & collaboration between eleven writers, artists, and programmers. 3. Please write your sixth #elitclass blog post: you can write on one of the above two selections or both texts. I still encourage you all to tweet your blog post using the #elitclass hashtag. Check out your classmate’s blogs as well since there is a wealth of insight generated there. Remember you are also encouraged to keep up the backchannel conversation on our #elitclass hashtag during class and even when we are not in class. I happy to see more and more of you joining in the tweeting. Enjoy the weekend. See you soon! From comics to generative remix…. Another pair of excellent presentations in Electronic Literature class! Thank you to Susan for walking us through Bigelow’s Brainstrips – a digital story-world laced with both parody & whimsy & a highly-concentrated, intricately-designed webcomic. I am happy you guys love Brainstrips! It is a fun but thought-provoking piece. Susan’s “Strip Your Brain” writing reflection on Brainstrips is very insightful and thorough. Please take a closer look at her smart blog post (if you haven’t read it already) in order to get a full sense of the complexity of Bigelow’s piece. The connection she made to the sensibility of the Ig Nobel Prize is spot on! Many of you shared quirky and thoughtful comments about the piece on twitter (in perfect keeping with the piece itself). After break we took a closer look at the well known generative poem created by Nick Monfort entitled Taroko Gorge. Thank you Vee for guiding us through a thoughtful conversation about machine-made, human-coded, reconfiguration-as-poetry. With a poetic lexia inspired by the meditative contemplation of nature, Taroko Gorge highlights the power and potential of recombinatorial computation. Our discussion lead to a consideration of remix-as-art-production, as we looked more closely at poetic composition in the face of the algorithm. Jr Carpenter’s remix entitled Along the Briny Beach figured front and center in our understanding as remix as a work of art (in and of itself). The horizontally scrolling texts quote authors who are writing about coastlines to evoke a condition of being in between places. Like the ocean tides that come in and out while erasing and effacing the flotsam of natural flow, her poetic remediation of the original source code focuses on movement and visuality for a new reading experience. Our reflections here lead to further thought about the changing role of authorship (in conjunction with the machine). We ended class with the beginning of a new part of the electronic literature journey: thinking about composing your own digital narrative. We took a bit of time to brainstorm and develop initial ideas for the story you want to tell! Please take a look at our shared brainstorm/draft document and add any new ideas if they have come to mind since class. We will pick up on this work in our next class. 1. Please read Facade. Priscilla will present a walkthrough and lead our discussion on this IF (an interactive animated fiction that can accept any type of language produced by the user and assimilate it into the outcome of the narrative.). 2. Please read Pieces of Herself. Nikki will present a walkthrough of this exploration of feminine embodiment and identity in relationship to public and private space. 3. Please write your fifth #elitclass blog post: you can write on one of the above two selections or both texts if you feel inspired. And another reminder to tweet your blog post using the #elitclass hashtag. Check out your classmates blogs as well. 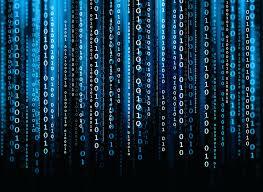 Keep up the chatter on our #elitclass backchannel conversation regarding electronic literature. I happy to see more of you joining in the tweeting during our class discussion and after class hours as well. Hope you all have a relaxing autumn weekend. See you next week! What #elit art is to political life (?)…. 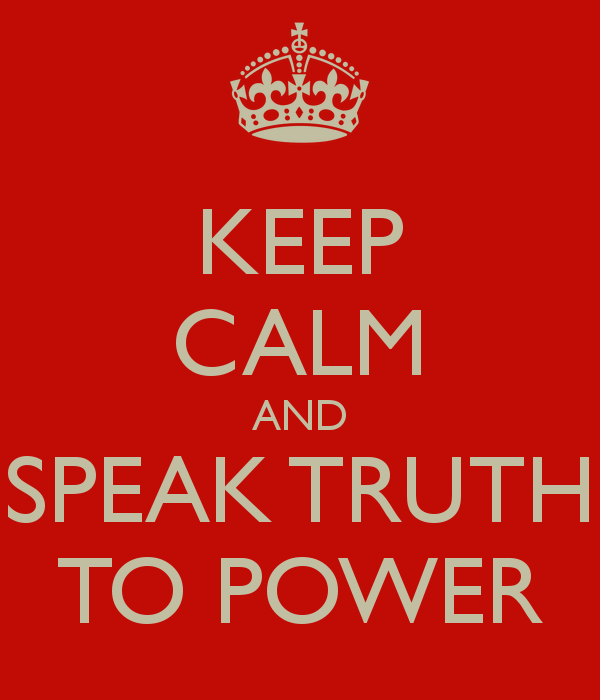 This week our #elitclass conversation was truly compelling as we spoke about how art may strive to speak truth to power, and the role that art might play in engaging people’s understanding of citizenship & the state (and privacy vs. freedom). Justin kicked off our evening with a walkthrough of the mash-up email-text generator entitled Scaremail Generator by Ben Grosser. hi #elitclass, enjoyed reading your reflections and discussions of #scaremail! stay scary! As the ELC 3 states: “Extending Google’s Gmail, the work adds to every new email’s signature an algorithmically generated narrative containing a collection of probable NSA search terms. This “story” acts as a trap for NSA programs like PRISM and XKeyscore, forcing them to look at nonsense. Each email’s story is unique in an attempt to avoid automated filtering by NSA search systems.” Scaremail addresses the governmental surveillance machine which algorithmically searches and then collects our digital communications in a (futile?) effort to predict behaviors based on words in emails. The Scaremail generator uses a Markov chain mash-up of words extracted from Bradbury’s canonical novel on the horror of censorship entitled Fahrenheit 451, blending this iconic literary lexia with the NSA’s predetermined keywords or “selectors” which are used to identify communications by presumed terrorists. The result is nonsensical and “scary” email content. Christina wrapped up our engaging discussion of #elit with some challenging questions as she asked us to reflect on the allegorical dimensions of the work. Where are we today in all of this? It is not an easy question to answer. Are we all to identify with the wolf? Or the children headed to the cave? …Sigh. 1. Please read the Taroko Gorge Remixes – from Electronic Literature Collection (Volume 3). Start by taking a close look at Nick Monfort’s generative poem entitled Taroko Gorge. Then take a close peek at “Along the Briny Beach” and a few other remix versions. See will present a walkthrough and lead our discussion on this mini-collection. 2. Please read Brainstrips by Alan Bieglow from Electronic Literature Collection (Volume 2). Susan will present her walkthrough and offer an analysis of this series of comic strips for the web. 3. Please write your fourth #elitclass blog post: you can write on one of the above two selections or both texts if you feel inspired. And another reminder not to forget to tweet your blog post using the #elitclass hashtag and check out your classmates blogs as well. I am including again some questions to get you started with the reflection: -What are some of the significant textual elements? -How did you choose to navigate these texts? -What visual, sound, interactive elements left an impression? -What overall effect do these texts create? -What themes and symbolic language emerge in navigating the text? -What is literary about the text? Finally, I am hoping you will all start using the class twitter hashtag #elitclass more often in order to respond to presentation ideas (as we grow our backchannel conversation regarding electronic literature). I am encouraging you to join in the tweeting during our class discussion. See you next week for more #elitclass insight! At the start of our last class, an intense rain was falling hard outside, and this seemed to spurn some campus-wide wi-fi funkiness. In short, the conditions put a damper on our connectivity, which really disrupted Stephanie’s overall plan for presenting the world of creative bots. Still, we soldiered on, and it finally worked itself out after some frustration. As Stephanie shared with us, Twitter bots are computer programs that tweet of their own accord. 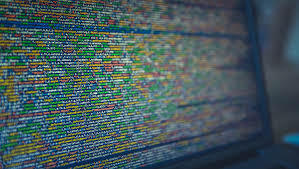 While people access Twitter through its web site, bots connect directly to the Twitter mainline, parsing the information in real time and posting at will; it’s a code-to-code connection, made possible by Twitter’s open application programming interface, or A.P.I. Everyone who uses twitter has seen a spambot or two. These are used mostly for public relations and commercial use. But there is also a growing population of creative bots that consume, remix, and contribute to a broader internet culture. In addition, you can check out this recorded “Studio Visit” conversation about bots and electronic literature in general (featuring Dr. Leonardo Flores, Prof. Alan Levine, yours truly, and several Kean University students). Next up was Kelli’s thoughtful presentation on Reconstructing Mayakovsky. This complex hybrid media novel gives us a trace-glimpse of a world from the future – a dystopia where uncertainty and discord have been eliminated through the corporatized promise of “freedom” and the power of technology. Reconstructing Mayakovsky revisits the past to make sense of our chaotic present. Author and digital artist, Illya Szilak, uses a variety of medias and methods, including manifestos, texts, animations, podcasts, music, and data visualisations. Her interactive multimodal multivalent mediascape-come-novel employs a variety of fiction genres to bring to life Vladimir Mayakovsky – a Russian Futurist poet who killed himself in 1930 at the age of thirty-six. It is worth taking a bit of time to read Kelli’s blog – a thoughtful analysis of all that is at work in this complex and layered work of art. 1. Please read the Hobo Lobo of Hamelin from Electronic Literature Collection (Volume 3). Christina will present a walkthrough and lead our discussion on this provocative piece. 2. Please read ScareMail Generator from Electronic Literature Collection (Volume 3). Justin will present his walkthrough and offer an analysis of this web browser extension that makes email “scary” in order to disrupt NSA surveillance. 3. Please write your third #elitclass blog post: you can write on one of the above two selections or both texts if you feel inspired. Don’t forget to tweet your blog post using the #elitclass hashtag and check out your classmates blogs! Some questions to get you started with the reflection: -What are some of the significant textual elements? -How did you choose to navigate these texts? -What visual, sound, interactive elements left an impression? -What overall effect do these texts create? -What themes and symbolic language emerge in navigating the text? -What is literary about the text? And please…enjoy this beautiful autumn weekend!